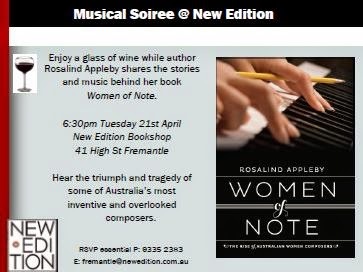 There are still some places available for the Musical Soiree at New Edition Bookstore on Tuesday. It’s essentially an author talk but more fun with musical samples and scandalous stories which invariably provoke plenty of discussion. My presentation gives a quick history of Australian composition by tracing three generations of women composers. The musical range is enormous. I find people are surprised by how much they enjoy my talks – I guess most people assume classical music is going to be a bit dull, but the lives and music from Women of Note are anything but dull! I hope you are able to come. Feel free to circulate among your networks but do note the rsvp requirement; the bookstore is cosy so there are limited numbers. Australian Book Review March 2012.